A great, basic phone: especially good for those who find normal mobile phones difficult. My aunt is 92 and has had problems hearing for some time. She recently moved into a nursing home and her phone has become more important than ever. Her old mobile phone was no longer up to the job – buttons too fiddly, she couldn’t hear anything. So she asked me to look into getting her a more suitable phone. I contacted Action on Hearing Loss (what used to be the RNID). It has an online shop which sells lots of phones. One of the advisors was sweet enough to take the time to really take on board what my aunt needed/wanted and suggested this phone: the completely unsnappily named Geemarc CL8450. With VAT it cost £80 (plus there are delivery charges) and it’s a Sim-less phone so there is no contract. I hooked my aunt up to Giff Gaff and she is on PAYG with an automatic top up linked to my card so she never runs out of credit. This phone has a ‘boost’ button the side so you can really amplify the caller’s voice (this makes it VERY LOUD so you have to be careful if you have normal-range hearing because you will end up deafening yourself) – it’s really easy to switch on and off. Equally however, it would be very easy to switch off by accident. The buttons are big and the screen is really clear. It’s a clam-shell design so you snap it shut to switch it off: I find people who are not used to mobiles get really worried about whether or not they’ve switched the phone off. The charger is linked to a cradle so you just pop the phone into it – no fiddling plugging in and out of cables, once the charger is plugged in, that’s it. And when the phone is in and charging, a light comes on. If you have to dial a number not in the memory (I set up my aunt’s phone book so it was all pre-set) the number you’ve just pressed not only comes up on the display but the phone speaks it back to you. It’s about a simple a phone to use as I’ve seen. Two other great features: it has three present memory buttons: M1, M2, M3 so my aunt has all her super important people at the end of one press of a button. At the back the phone has an SOS feature. If you press the button it emits an alarm, but it also will start to ring a sequence of numbers which you pre-programme into the phone. If one person doesn’t pick up (I believe, I haven’t tried it) it will ring the next. You can also pre-record a message, e.g: Aunty May is in trouble, please call round. You can do anything you would normally be able to do with an analogue phone – i.e., make calls, text, it has an inbuilt phone book. You can’t take pictures and it’s not a smart phone. Hurrah! The instruction manual is also better than most, although there is no way my aunt would have figured it out. I loved this phone, but more importantly, my aunt loved it. I think she’s been ringing the whole of Italy with it. I’ll have to check my credit card..It’s absolutely perfect if you have any one who hates normal mobiles because they are too complicated, or struggles with the size of the buttons or to hear a conversation. It also has loads of other features I didn’t look into. Unfortunately, I didn’t take a picture so the one attached is a stock photo off the website. Sorry. This entry was posted in Consumer and tagged elderly relatives, mobile phones, phone on March 11, 2016 by Annalisa Barbieri. 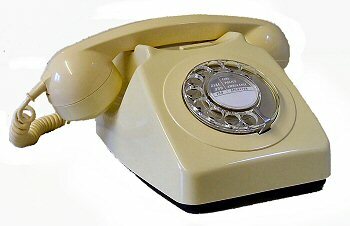 Growing up, we had an old BT cream phone. We used to rent it from BT and it lasted ages. I think we got rid of it in the end – why? – to update it not because it had broken. We had a phone just like this and it never broke down. Sniff. I learned to dial numbers on it, and remember clearly being able to dial my father at the restaurant he worked in and what a rite of passage that was. But those were back in the days when every number didn‘t consisted of double figure digits and led you to an automated answering service, “press one for blah” etc. Dial phones just aren’t practical anymore. 2) The beauty of a cordless phone is also its downfall. It moves, and I could never find it. Yes I know you can ‘page’ it, but I just spent ages looking for it and in the end I thought if there were ever an emergency, I needed to know where the phone was. Quickly. I kinda longed for the days when the phone was static, in the hall, on a table with a notepad next to it. Oh those were the days, etc. 3) The smaller cordless phones get the harder it is to chat on them AND do anything else, you can’t wedge them between shoulder and jaw like the big old handsets of yore. But it became apparent very quickly that this beautiful object (objet) just wasn’t cut out for anything other than calling local folk using six digits only. And I do have plenty of those to call. But anyone else and it was highly laborious. It sounds lazy, dunnit, but dialling the eleven numbers most mobiles now have took ages, especially when I misdialled. You could also never tell what number you had just dialled if, like me, you forget between dialling and the person answering… As I said above, calling companies with an automated service was out (you could use a mobile, but still) but the biggest pain was not being able to use the Call Minder function so easily. You had to say “one” instead of just pressing it. It was not hard work however, and I forgave it because of the wonderful ring it had, and I just loved it. Then it stopped working. When did phones become such lightweights? I mean I grew up with my old home phone. It was used by my mother to call the doctor when I was three, and had mumps. It was used for hundreds and hundreds of phone calls to Italy. And it was still there when, as a teenager, I made several pointless calls to my friends (“whatcha doing?” “Nothing, you?” “Nothing” etc etc). And my father read my exam results down the phone to me when I was sixteen and in Italy being chased by boys over a very long, very hot, very exciting summer (Italy won the world cup! It was Zoff’s last World Cup!) in 1982. We need a landline. And I just can’t buy a new, cordless, anonymous, non-long lasting stupid cordless phone that has twelve million features that I don’t need, not to mention storing numbers so that I end up not remembering anyone’s numbers anymore. So I looked for a 1970’s phone. Lordy they cost! 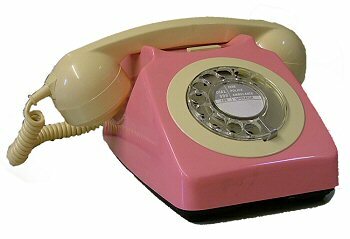 I found this one which is just beautiful, but I’m not spending £70 on a phone just because it’s pink. Beautiful isn’t it? I bet Lady Penelope had one. I was tempted by the original 700 series (as seen in cream, above). I wanted a wall mounted one, such as I used to see in American sitcoms (mom would be making brownies and the lead would stretch for half a mile), but they are very rare and expensive and probably don’t last because they’re very rare and have been used and reconditioned twelve million times. In the end I went for one with a mechanical ring (check out the ring here) but with push button facilities. This means it’s a reproduction but hopefully it will last longer than a haircut. This is wot I got in the end. Will report back. This entry was posted in Consumer and tagged phone on December 5, 2009 by Annalisa Barbieri.